It is Saturday morning. I wake before the sun and quickly throw on some clothes. I grab whatever is in the kitchen to eat for breakfast as I drive to my place. I can't wait to get there. I had a hard time falling asleep last night, because I just want to be there. My place is a place where a person can just be. I find a spot to park and jump out of the car. I decide that today I will go around the lake before I head up to the pines. It's still a bit chilly as the sun is rising, and I can see drops of dew on the hundreds of spider webs that appeared on the reeds overnight. When the crushed concrete trail turns to boardwalk, I see fresh, wet deer tracks on the wood planks. Further down, I see old, muddy raccoon tracks. I pass the trees that are home to the great horned owl. The owl is quiet, and I don't see him. As I approach the tamarack trees, Bob comes into view from the other direction. "See anything interesting?" he asks me. He tells me that he just saw a little opossum, and earlier, he saw 3 bucks. We talk for a few minutes, and then we go our separate ways. As I get closer to the other side of the lake, I notice an interesting piece of bark on the ground. I carry it with me up into the pines. My mind is already beginning to shape it into art. I hike the short loop and notice that many clumps of pine needles have fallen to the ground since yesterday. They are mostly green clumps, but a few are orange, and there are even a couple of yellow ones. I know I will make a gorilla today, but first I need to find some eyes. I head out of the pines and walk past the maple trees. As I enter the land of abundant acorns, I scan the ground, searching for what I need. At the bottom of a large oak tree, I find the perfect pair of acorns, almost immediately. I carry them back to my stump and start creating. It takes me almost an hour to get the gorilla just right. 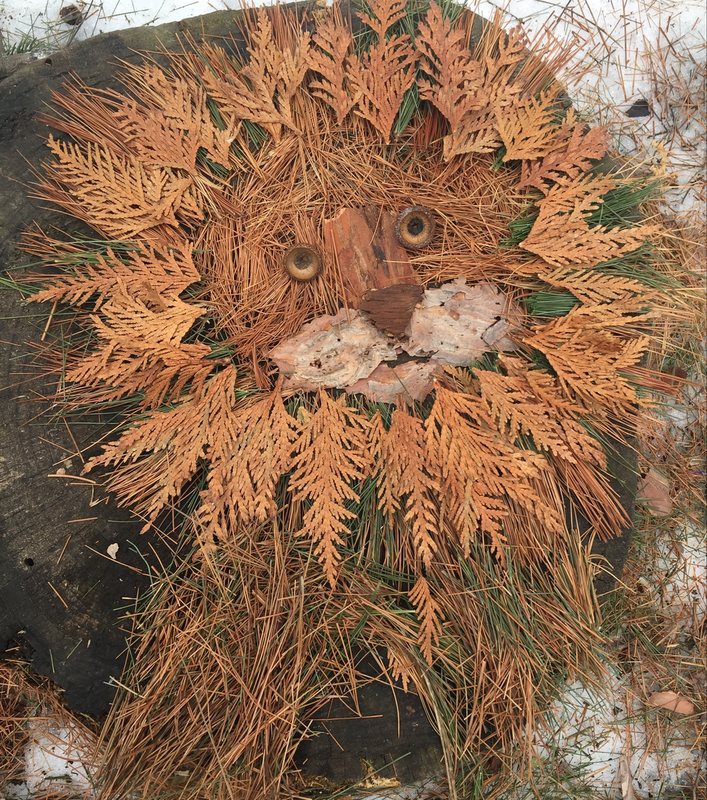 He is mostly green pine needles, and a little bit of bark. When I am done, I take a photo to remember what I have made. I never know if what I've created will last a minute, and hour, or a day. 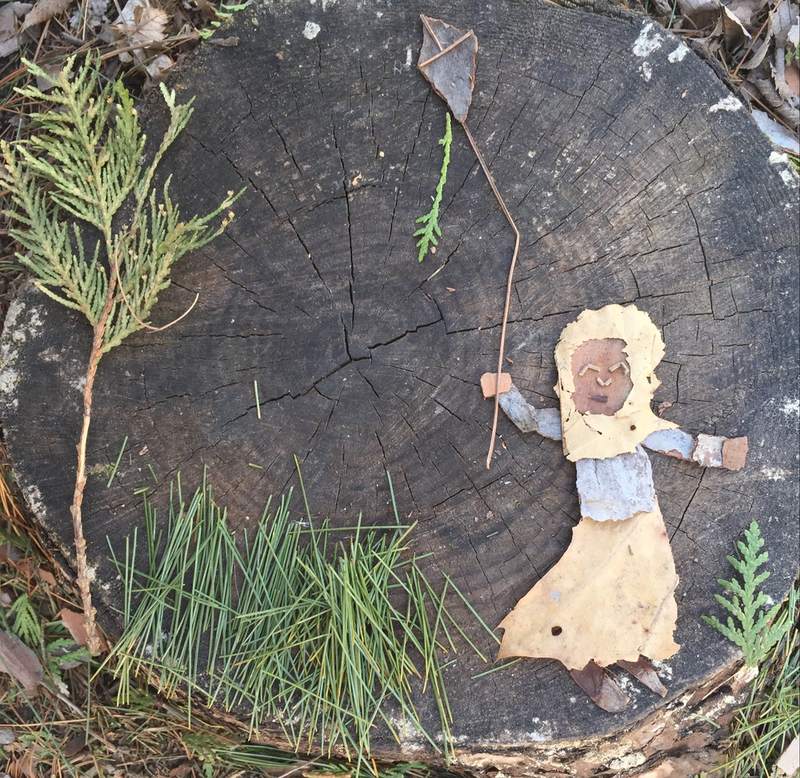 As I move to my next stump, I collect pieces of pine bark. There is a little slug on the back of one of the bark pieces. I admire the slug’s soft sliminess before I set the bark piece down where I found it. I know that I will be creating a scene with children playing. I'm picturing two little girls with sticks in their hands. I look around on the ground to see if there is anything else I could use. I pick up some sticks and bring them with me to the stump. I'm just finishing the hair on the second girl when Jon comes walking up. He asks me what I'm working on, and I tell him. We talk for a few moments before he continues on, in search of the gorilla. I've finished up the scene with the girls when Denise comes strolling by. Denise has previously told me that she visits this park almost every day, specifically to see my art. We talk for a few minutes before Denise is off to finish her walk. I hear children shouting, and I feel tense for a moment. I am worried that they might destroy what I have created on the stumps. As the family with two little boys comes into view, I relax. It's okay if my art is brushed away by excited little fingers. I can always make something else. The important thing is that the children are outside interacting with the natural world. I've come to this place to create art almost every day for the last three years. I didn't start out trying to make art. I never even thought I had any artistic ability. I can't draw, or paint, or sculpt things from clay. I was just trying to give kids more opportunities to play outside. While the children played, fighting dragons and searching for treasure, I started noticing things. The curve of a stick. The shape of a piece of bark. The different colors of pine needles. One day I put them all together, to create something else. 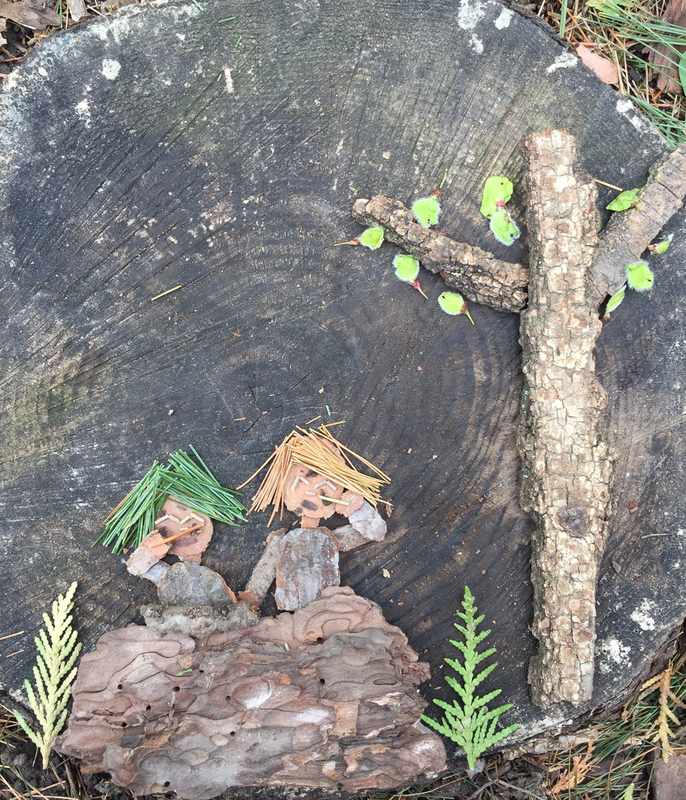 Before I knew it, I was spending all my free time in the woods, creating pictures on stumps. Soon, other people started noticing. Today, there is a regular following of people who visit the park to see my art. They are young, old, and everything in between. I continue to make my creations for them, but I also do it for myself. My time in the woods is my time to play. It's when I get to do what I want to do. I like that my art motivates the people in my community to go outside. I am not changing the whole world, but I know that my art has had an impact on those around me. I think it’s especially important for children to see an adult getting dirty, using imagination, and trying new things. I create nature art with the hope that it will brighten the days of those who come across it, and encourage them to look beyond what they see with their eyes. You can check out more of Chelsey’s work here. Read her book “Today I Will Play” here.